This episode is brought to you by Business Advancement Incorporated, enabling successful leaders and companies to accelerate to their next level of success. On the web at BusinessAdvance.com. And now, here’s Pam and Scott. Pam Harper: Thanks, Chris. I’m Pam Harper, Founding Partner and CEO of Business Advancement Incorporated. And sitting right across from me, as always, is my business partner and husband, Scott Harper. Hi, Scott. Scott Harper: Hi, Pam. 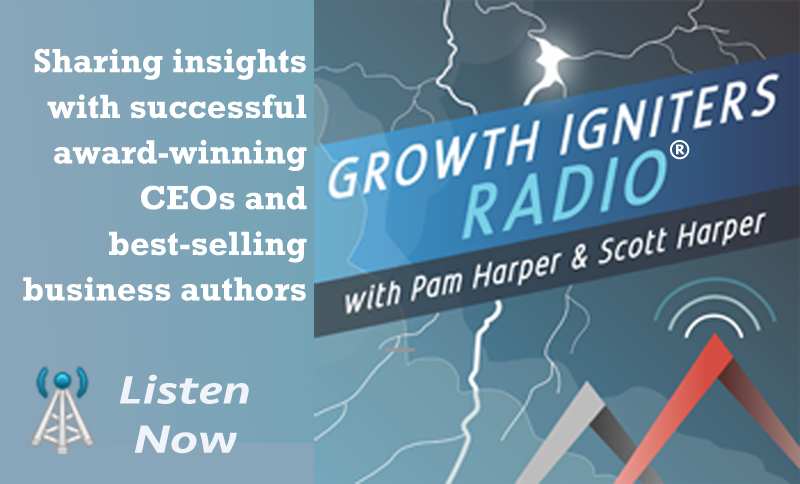 It’s always a pleasure to join you for another episode of Growth Igniters® Radio. And, as always, our purpose is to spark new insights, inspiration, and immediately useful ideas for visionary leaders to accelerate themselves and their companies to their next level of game-changing innovation, growth, and success. Now, to do that, it’s important that everybody works as effectively together as possible. But the concept of “us and them” has been around forever, and it can get in the way. It seems that divides between groups are becoming stronger and stronger almost every day. Pam Harper: Yes. It seems that there isn’t a day that goes by that the issue of both belonging and tribalism doesn’t come up. This is true all over the world, and it’s especially a challenge in business. I mean, even today, as I picked up the headlines, there was another one that we don’t have to go into specifics. It just happens all the time. This comes out in not just interactions within companies but with customers, vendors, partners, and other stakeholders. Not only is it costly in terms of reputation, financial costs and more, it can also rob us of significant opportunities for bringing new value to the world and growth. Scott Harper: That’s a real challenge. Pam Harper: There are no easy answers to this issue. Yet, we just can’t give up. We need to understand what’s behind tribalism and look for ways to bridge the growing divide. Pam Harper: Our guest today is an expert in this area. He is Howard Ross, a lifelong social justice advocate and the Founding Partner of Cook Ross Incorporated. He’s considered one of the world’s seminal thought leaders on identifying and addressing unconscious bias. Howard has delivered programs in 47 states in over 40 other countries to audiences including Fortune 500 companies and major institutions within healthcare, government, and nonprofit sectors. He authored the Washington Post’s bestseller, Everyday Bias, as well as ReInventing Diversity. His new book, Our Search for Belonging: How the Need for Connection is Tearing Us Apart, describes how to bridge the divides in our increasingly polarized society. You can read more about Howard by going to Growth Igniters Radio, episode 144. Howard, welcome to Growth Igniters Radio. Howard Ross: Thanks so much, Pam. It’s great to be with you both. Pam Harper: So, tell us what was it that prompted you to write your book, Our Search for Belonging. Howard Ross: Well it’s interesting, Pam. I’ve been somebody who spent most of my lifetime focused on social justice – I’m 67 years old, and I went to my first civil rights meeting when I was, I think, 15 or 16. And so, I spent more than 50 years working on social justice issues and trying to deal with challenges in our society – and professionally as a practitioner of organizational development work and diversity work for over 35 years now – addressing these issues. I’ve always prided myself as being somebody who could really listen to the other point of view and try to understand people on the other side. Yet, at the beginning of this last political round that we went through, the 2016 elections, I began to notice how much I was being sucked into the “us versus them” more than I ever had before. And of course, when I looked around me, I realized it wasn’t personal. But this was true for most people. My natural tendency is to try to understand things, and I really do believe that the only way to resolve issues is by first trying to understand them. Pam Harper: So one of the things that you talk about in your book is the paradox of how the need to connect is tearing us apart. In fact, that’s the subtitle of the book. Tell us more about this paradox. Howard Ross: Sure. Human beings fundamentally need to be parts of groups in order to survive. This probably goes back to the very earliest stages of us as a species when we were living in caves and jungles. If we put ourselves back in those times, we could see that it would be almost impossible for somebody to survive unless they were part of a larger group. If you got injured, if you were sick, if you were attacked by another group of people. If you were by yourself, your chances of survival were virtually nil. And so, people lived in groups. They lived in tribes, mostly kinship based in the earliest days. That allowed them to know that they had support, that they had strength, that they had people to go to war with if necessary. They had people to build things with if necessary, to hunt together with. Over the course of our history as human beings, those groups have expanded from kinship into other kinds of groupings. But we’ve always had this inherent tendency in us to divide people between us and them. As you know in the book … Well, some of the research that we talk about is some extraordinary work that’s being done at the Yale Baby Lab now, where they can identify these patterns in babies as young as four, five, six, seven, eight months old that already children are beginning to divide people into us and them. Pam Harper: So we’re hardwired for this. Howard Ross: That’s exactly right. And so, look at what’s happening in our society today, between a combination of factors. We have a bifurcation of media, which now has us get different information than the people around us. This is not like the old days when we all used to look at NBC, ABC, and CBS, and get basically the same information. Now we have pre-interpreted news that comes to us, and social media, which, again, feeds information that becomes an echo chamber we’re living in. I like to say we’ve moved from being in a bell-curve society, where most people are in the middle and on an issue-by-issue basis might team up with certain people and team up with other people on other issues, to a “dumbbell curve,” where we’re now all in the extremes, and nobody’s in the middle, and it’s no longer about issues. It’s now about identities. I know I’m going to disagree with you about gun rights, for example. It’s now you’re one of “those kinds” of people. As soon as that happens, you have more stereotyping, more bias, and a phenomenon that we call the “out-group homogeneity effect.” We tend to make all of those people the same. Scott Harper: Now, there are many, many, many different types of groups, and it’s very easy to talk about “those people” whether it’s racial, or it’s in a different functional group – you know, manufacturing versus research and development, or whatever. In your book, you chose to focus on four particular types of divides: Politics, race, religion, and the media. Why did you pick those? Howard Ross: Well as you say, Scott, we could have chosen any number of others. We could have looked at the divide around sexual orientation, around gender, and the like. To a certain degree, you’re just limited by space, and what we didn’t want to do was to build so wide that we didn’t get into any depth on any of the issues. So when we look at the issues to choose, we thought that these were four issues that we could look at that were very distinct and clear and that most people could relate to, and that they also linked to each other because of course, media and politics are very closely associated with race and religion in today’s world. But we could very easily have talked about the same dynamics and how they occur in other areas. Now, gender is an interesting one, because gender, of course, is so intersectional. Unlike some of the other issues, almost everybody has somebody in their life of the opposite gender who they have intimacy with and some kind of a bonding with, whether it’s our … If we’re men, they’d be our mothers, sisters, grandmothers, cousins, or the like, and if women, the same thing. So we just decided that these were the four that we wanted to particularly focus on for this particular work. Pam Harper: What’s interesting is us and them keep shifting. I think of like a kaleidoscope. You know, one day it’s about, say, racial, but another day the “us and them” changes. But you’re the same person. Which group are you part of? You’re part of many, aren’t you? Howard Ross: Well, that’s very important for people to understand, Pam. We tend to look at these issues as distinct from each other. But the truth is that we’re all intersectional human beings. We all have multiple identities that we function from. The particular circumstance that we’re in might stimulate one of those identities. I remember a number of years ago I had dinner one night with a man named King Jordan who was at the time the President of Gallaudet University, which is a university for the hearing-impaired in Washington, DC. He said, “African American female student at Gallaudet, when they’re off campus, likely relates to the world mostly as being deaf because that’s the greatest challenge that they face. When they’re on campus, mostly relates to the world as being black, and when they’re in a black community on campus, they might mostly relate to the world as being women. So often, with that same collection of identities, it’s almost like tiles on a computer screen. When you click one, it takes over the screen, but he others are just behind it. They can come forward if we click on them. Certain circumstances we’re in or certain things that happen might trigger that particular one being activated. So, for example, for our listeners who are African American, after something like Ferguson happens, their African American identity becomes very prominent very quickly because it was a race-based dynamic, whereas when something like the Me Too movement happens or the Harvey Weinstein case, or one of these kinds of things, the gender identity issue might be the one that moves to the front. And so, we’re constantly in this back and forth between which part of ourselves is most activated by a particular circumstance that we’re in. Pam Harper: Okay, so, at the beginning of the episode, we were talking about how, of course, this really shows up in business. Let’s talk about this. Let’s not go away from it. How do you see it happening? Because we certainly see it in our work. Howard Ross: They say that the Chinese symbol for crisis is a combination of two symbols — danger and opportunity. I think that it’s perfect for the circumstance that we’re in right now, especially relative to businesses. The danger is that … What happens is when we have people who are put together in business and have to work together, you know, unlike most areas in our life, we don’t get to choose the people we hang out with at work for the most part unless we’re the CEO of a company. We get put into sometimes even in the same room or the next cubicle from somebody who might completely differ with us relative to their political points of view, relative to other personal points of view. And yet, we still have to work together because our job requires it from us. Now, the opportunity in that is huge because the workplace is one of the few places anymore where that happens. Our research shows that schools are more segregated now than they were in the 1960s. Dr. King said many, many years ago that “11:00 Sunday morning is the most segregated time in America,” and that hasn’t changed all that much. We know that the Cook Political Report has studied and found that we’re living in more homogeneous political enclaves than we ever had before. The people around us, our neighbors, the people we shop with, the people we go to the barbershop or the beauty salon with — all of these people will tend more than ever before to agree with us. And so, the workplace is one of the few places where people are put together who are different. In that sense, it’s a huge opportunity for us to use the workplace not only to heal those relationships but also to have a healing role in society. The danger is, of course, that if we don’t address those issues in the workplace, the distrust that people have grows. Why? Because the other person voted for a different candidate than I do, or because I question the person’s racial attitudes, or because they’re a born-again Christian and I feel like that means that they diminish me as a Jew or a Muslim or a Hindu or a Buddhist or something else. Or vice versa, by the way; Christians can also feel diminished. All of these differences can contribute to a breakdown of trust in a relationship at work, a breakdown of effectiveness, a diminishing of innovation, resistant willingness of people to bring ideas forward and the like. A tendency for people to do what Robert Putnam, the great Harvard sociologist, calls a “turtling effect” — you know, pulling back in our shells. When that happens, of course, we lose not only effectiveness but also success in business. Scott Harper: You’re listening to Growth Igniters Radio with Pam Harper and Scott Harper, brought to you by Business Advancement Incorporated, on the web at BusinessAdvance.com. We enable successful companies to accelerate to their next level of game-changing innovation and growth. Pam Harper: We’d like to welcome our many new listeners in addition to our regular listeners. If you’re not already a subscriber to our Growth Igniters community, you can get even more value by signing up. You’ll receive reminders of our new bi-weekly podcasts, along with a link to a page filled with all kinds of resources. On off weeks, you’ll receive a Growth Igniters post, about a two-minute read. Pam Harper: Welcome back to Growth Igniters Radio with Pam Harper — that’s me — and Scott Harper. Scott and I are talking today with Howard Ross, Founding Partner of Cook Ross Incorporated and author of Our Search for Belonging: How the Need for Connection is Tearing Our Culture Apart. Howard, how can people find out more about you and your books? Howard Ross: Well in terms of the work that we do, you can go to our company website — Www.CookRoss.com. People are also welcome to send me a personal email at Howard.Ross@cookross.com. The book itself is published by Berrett-Koehler, and it’s being distributed by Penguin Random House. And so, it’s available at most booksellers and Amazon, online and Barnes & Noble and all the online booksellers as well. Pam Harper: We really highly recommend this book. It is so thought-provoking. There are so many nuances to it. One of the most interesting pieces was when you got into the unconscious biases and the fear that drives the us-and-them divisions. Can you talk to us more about that? Howard Ross: Sure. Well, first of all, we know — and this is the work, of course, we’ve done previously; this is what the focus of my second book, Everyday Bias, was 100% about, which is that human beings are biased. And we know this; this has been one of the great fallacies of a lot of the work that we’ve done around diversity and inclusion for many, many, many years — that is that we’ve tried to make bias go away. What we realize now is that you can’t make bias go away any more than you can make breathing go away, because bias is a fundamental function of the brain and how it works — that we very quickly make determinations to see who’s safe and who’s not. I mean, if we go back to that earlier time in our history that I spoke about before, if you were living in a cave or a jungle and you came out and you spotted a group of people around the waterhole, you had to learn to make an instant determination whether it was them versus us. If you made the wrong one, you tended to die. As a result of that, we learned to distinguish who’s safe and who’s not safe, who’s valuable and who’s not valuable, who makes us comfortable and who makes us uncomfortable. We know we’ve had over 1,500 studies in the last 10 years alone that shows that these kinds of biases perpetuate every aspect of our lives. The big breakthrough that we had in dealing with bias was a recognition that pretending it’s not there or trying to make it go away is actually folly. In fact, it’s much more productive to recognize our biases and learn to manage them or to deal with them. Now, what happens in times like we’re living in now where you have a highly energized fear center, and I would suggest … I don’t mean this clinically. But just more generally that we’ve been living as a society in post-traumatic stress since 9/11. The combination of the 9/11 events, the economic breakdown of 2008, all these kinds of things has led us to a highly fear-charged society. What we know about human beings is that three things happen when an “amygdala hijacking” takes over — which is a term that Daniel Goleman used to describe these kinds of circumstances. First of all, what happens is, the limbic system — the fear center of the brain — takes over the system. Our more advanced thinking, the prefrontal cortex checks out because we’re on high alert. Anybody who’s been in a highly fear-driven situation — you come into your house at night. It’s dark. You hear a sound — all of a sudden, you feel that alert in your body. It’s almost like watching a dog on a hunt or a cat when you’re hunting for somebody. Three things basically happen to us as human beings at those times. One is we go into reactive responses. That is a fight, flight, or freeze response, and immediately we begin to move towards safety as quickly as we can. The second is that we begin to perceive what’s happening as personal, permanent, and always going to be around us, persistent. And so, we begin to think that the circumstance is basically always going to be this way. The third thing that we do, which is most important to understand right now is we want to take control of the situation. Now, that can happen either personally — that is, I want to take control of my own life by making decisions for myself — or societally by turning towards a strong leader — usually, a man interestingly enough, who can offer us a solution. They could be our savior. If you think about Germany in the 1920s and 30s, after World War I, Italy, pre-Mussolini, Afghanistan, before the Taliban. All of these are good analogies to this kind of circumstance. When we get into that mindset, a very interesting thing happens. We will take a real threat from a small group of people — let’s think of Muslim terrorism as an example — we take a small threat from a very tiny percentage of the one and a half billion Muslims in the world that has participated in terrorist activities as representative of the whole. But it’s difficult for the frightened mind to say, “How do I determine which ones are scary, which ones are dangerous?” Instead, “Just keep all of them away from me.” We turn it into a broadly perceived threat among all people because it’s easier for the frightened mind to say, “Keep all of them away from me,” than it is for me to try to figure out which ones are dangerous. As a result, we see something like the Muslim ban, which 20 years ago, you know, a huge percentage of Americans would have said, “This is just un-American,” is now supported by a large number of people. It’s because of that fear that generates it, and that same fear can come into our workplace environments and impact whom we decide to trust or not trust, who’s working next to us. Pam Harper: Well so, it’s also fueled a bit by the media as well. I mean, people, before they go to work, they’re perhaps listening to their favorite radio station or a podcast or whatever it is. Can you talk just briefly about how the media works in with this as well? Howard Ross: Well Pam, if it were only before we went to work, that would be one issue. But of course we know that today, we’re getting it 24/7 because our phones are constantly pinging all day and sending us messages about the next story, and it’s challenging because of course the same instrument that we’re using for looking at our text or getting our phone calls is also sending us the news on a constant basis, and that’s one of the real issues we have. Years ago, you watched an hour or maybe an hour and a half of news. Maybe half an hour in the morning and an hour at night. You read your newspaper when you got a chance. But that news was pretty homogenized because the very structure of the news was different. First of all, when you had major stations … It’s not mostly about broadcast media now. Major stations, like ABC, NBC, and CBS couldn’t afford to turn off half of the population by taking strong political points of view. And so, they basically gave the news, and it was considered unethical in those days or really unusual for a news broadcaster to give a strong opinion. If you remember when Walter Cronkite came back from Vietnam and made it clear that in his point of view the war was unwinnable, it was seismic. In fact, Linda Johnson said at one point, “When we lost Walter Cronkite, we lost the country.” Nowadays, of course, we don’t even watch the news anymore. We watch people watching the news. We turn on our station, and we see a “panel of experts” — I say that in quotes — who are opining about what happened before we actually heard the fact of what happened. If we watch MSNBC, we get a completely different body of facts and experts than we do if we watch Fox News and CNN and on and on. So the media is constantly now shaping what we see, giving us information that’s quite different from the information we get on another station. One of the things I’ve done ever since I wrote Everyday Bias, because there was a section of Everyday Bias that really focused on the unconscious drivers in elections, I’ve been watching multiple news stations. It’s fascinating to see how differently the news was covered. Just as an example, last November, when the Virginia gubernatorial race occurred. If you remember, it was a very positive election day for Democrats because that race plus a couple others went strongly towards Democrats. So I watched three stations that morning as I was exercising. CNN came on first. It was a fairly typical news coverage. You know, John King at the magic board, circling counties, and these kinds of things. Then I switched to MSNBC and the mood there was, “All right. We’re coming back, baby.” It was very sort of upbeat. Then I switched to Fox, and what Fox was running that morning was videos of the year before President Trump wins Wisconsin, President Trump wins Pennsylvania, President Trump wins Michigan. That night I turned on Sean Hannity for a few minutes, and he opened the show by saying, “Ladies and gentlemen, this is Sean Hannity. President Trump lost those three states anyway. Now, onto the news.” His entire news coverage of the election was 5.2 seconds. So depending upon which news station you’d watch … And by the way, I could give you the examples in the other direction too. I want to be really clear that everybody is doing this now, not just one side. We of course always think that the other side is doing it more than us, but it’s happening all over. Scott Harper: Now, these divisions are ubiquitous as political. It’s racially based and so on. It shows up at work, obviously, and conflicts between those different groups. It can also show up at work in conflicts, between any number of other groups, functional groups even. So the question is — since none of this is good for business — how can top leadership help bridge the many, many divides that exist? What kinds of conversations need to take place at the top and go throughout the company? Howard Ross: Yeah, well, you’re absolutely right, Scott because so far, we’ve talked about social issues. But the truth is that you can have differences in businesses between the human resource department and the production department or between one geographical location and another geographical location or differences between management and non-management, you know? So the same patterns and difference show up. Howard Ross: Well put. So there are a number of things that we’ve identified through our research … By the way, I want to acknowledge Jon Robert Tartaglione, who was a mentee of mine, who actually helped enormously with the research on this book and the writing of the book, and also Nyki Caldwell, who helped us with the organization and editing of it — just to make sure that they get a shoutout. What we noticed is that there are organizations that have built themselves to create greater unity. Notably, as you know, in the book I talk about Kaiser Permanente had a long interview with George Halvorson — who’s the former CEO of Kaiser, who did an amazing job of creating a culture of belonging there. Target Corporation; Caroline Wanga who’s the chief diversity officer there, or General Mills; James Momon who’s the chief diversity officer there — who’ve done some great work around creating opportunities for courageous conversation. But we did identify that there are some very clear pathways that we can create that can help organizations create a greater sense of belonging. Pam Harper: What’s a good place to start? Howard Ross: It starts with each of us accepting the responsibility that as the citizens of a democracy, we have something to say about this. We don’t have to sit back and just be victims of it. There’re things that we can do, and that occurs at three levels, I would say. The first is personal, and that is to begin to reach out to people in your life who you know disagree with you and have conversations that are meaningful, not because you’re trying to convince them to change their mind, but because you’re trying to understand their point of view. There’s a wonderful little tool that we included in the book from Elizabeth Lesser who was one of the co-founders of the Omega Institute in Rhinebeck, New York, called Taking the Other to Lunch. I won’t take the time to go through it right now. But it’s a very helpful tool to have that kind of a conversation. One of the things that I did in research for the book, is to go out and start talking to Trump voters because I tend to be on the other side politically. I’ve interviewed now over 100 people using this technique. It’s very effective and it’s a great way to get a deeper understanding of where people are coming from. The second is whether you’ve got a chief diversity officer or not, everybody in any organization can begin to bring people together to have a healthy conversation. There are again tools listed in the book as to how to do this. How do we have these courageous conversations? How do we have conversations for mutual understanding? A lot of it can be impacted by sharing each other’s stories and the narratives of our lives and how we got here. Then the third is, looking at the broader political sense, is to think about the leaders we choose, not only from whether or not their point of view is consistent with our point of view politically. But also, are they people who are willing to stand for civility and political discourse and willing to stand for looking for compromises, looking for ways to create solutions to problems, and not just demonize the other? Pam Harper: So having the ground rules and making it a priority to have these conversations in the first place is a very important thing. You can’t just always focus on, “Here’s what we have to do today,” right? Howard Ross: That’s absolutely right. We have to have a larger framework of listening. Pam Harper: But let’s talk about beyond conversation and training. What types of policy and process reinforcements can promote an “us” kind of orientation as opposed to an “us-versus-them” orientation? Howard Ross: Have very clear guidelines for civility and respect within the organization. What’s acceptable behavior? Now, I know we’re living in this world of people reacting to political correctness as it gets anathema. I’m certainly not arguing for over-the-top political correctness because I do believe that that has contributed to the problem to some degree when we’ve gotten overzealous about political correctness. But it is completely appropriate to say that we have a standard for how people treat each other within our organization that does not accept certain kinds of uncivil behavior, and that allows us to have respectful conversations within a container of safety. Think of it this way. If you’ve got a young child or a dog that you want to put out in your backyard, and you know that your fence is completely sealed, you don’t have to look every minute. Your child could be playing in the sandbox. Your dog could be running out in the backyard. You don’t have to look every single minute. You’ll check occasionally. But if you have holes in your fence, then you’ve got to watch them like a hawk every minute because they may wander out of the fence and into the street. Similarly, if we have a very clear container of understanding, of norms set up within our organization, of ways of being that we hold true to, it’s a lot safer for me now to get into conversations with people around me or to approach people when I have a concern because I know that we’ve got an agreed-upon pact of civility that will allow us to have those conversations without it being toxic. Pam Harper: And that’s the beginning of building a bridge for sure. Howard Ross: Yes, that’s correct. But leaving these issues unaddressed not only contributes to us-and-them divisions in companies, it can also create huge costs in time, energy, and resources. Pam Harper: That’s why we encourage you to read our Harper report, Taking Control of the Elephants in the Room. This is one of our more popular reports because it’s practical, and it addresses an issue that every leader and leadership team faces at one point or another, especially when we’re moving fast and faced with uncertainty. In fact, one executive team was able to shave six months off the time of their product launch and saved millions of dollars by taking control of the elephants that were in their room. Scott Harper: So go to GrowthIgnitersRadio.com, select episode 144, and request your complimentary copy of the report, How to Take Control of the Elephants in the Room. Pam Harper: Welcome back to Growth Igniters Radio with Pam Harper and Scott Harper. Over the last two segments, Scott and I have been talking with Howard Ross, Founding Partner of Cook Ross Incorporated and author of Our Search for Belonging. Howard, can you remind us again of how people can find you, your company, and your books? Howard Ross: Sure. We can be reached at www.CookRoss.com, or I can personally be reached at Howard.Ross@cookross.com. The books are available on Amazon, Barnes & Noble, or any other online bookseller, and even in bookstores. I was in Seattle … in Portland rather the other day, and there was a Powell’s, and I think most large bookstores now have it in stock as well. Pam Harper: Great. And of course, you can find out more about Howard and some of the things that we’ve been talking about in the resources section for this episode by going to GrowthIgnitersRadio.com and selecting episode 144. Howard, we’re at the point of our podcast where we talk about three immediately useful ideas. In this case, it’s for building bridges between “us and them.” So what would be an immediately useful idea? Something people can start doing today right away that would help us to become more aware of our own biases about race, religion, politics, or the media? Howard Ross: I would say the first and most important is to reach out to people in your life who have different points of view than you about anything. Now. It could be a specific issue, or it could be a general philosophy; try to generate conversations for understanding. As I mentioned, there’s a tool in the book, the Take the Other to Lunch tool that you could use, but any number of ways to do this. The key here is to make an agreement beforehand that we’re not here to convince each other. We’re not here to change each other’s minds. We’re here to really understand each other and to ask a few questions. One is, what has you believing what you believe? One of the things that we forget is that every villain is a hero in their own story. Everybody’s point of view is representative of their experience and their story. If we can understand the why, we can get underneath that back and forth about the disagreement and figure out if maybe you need to believe this for this reason and I need to believe the other for the other reason, maybe we can find another way to get both of our needs met. The other thing is to look at what it is that scares you about the other point of view. So these are really important. And so, that’s the very first thing. Pam Harper: So, being curious. Howard Ross: Being curious rather than trying to convince each other. Scott Harper: How can we get past our assumptions and our automatic reactions, these knee-jerk things about people who are different from us and learn about them instead? What if I had this just visceral response? Howard Ross: Well I think one of the things … I like to say to people that one of my sort of mantras in doing work in organizations is if you’re hysterical, it’s likely historical. When you had these strong, emotional, knee-jerk response, it’s almost always because it’s triggering something from our past, some insecurity, some sense of vulnerability that we have that this other person’s point of view is triggering. Now, that doesn’t diminish it by the way, but it just is helpful to keep that in context. Why am I so strongly triggered by this? Well, it’s because it brings up this fear I had that something that might have happened to me before or happened to something like me before would happen again. And so, the work that we do on ourselves we might say is the second dynamic of the three that you were asking for, and that is to pay attention to your own biases, to accept the fact that you have bias, and rather than try to pretend like you don’t, to understand what they are, where they come from, and how they’re affecting your behavior, and to what degree that you’re generalizing them to large groups of people relative to just focusing on individual behavior. So if we can look at ourselves and understand ourselves better and then reach out to other people and try to understand them, we’ve gone a long way toward being able to coexist and agree to disagree. From that place, we can often find a compromise. Pam Harper: It’s also important to look at it as being very mindful. So often we’re in a reactive mode that we’re not taking that time, like you’re saying, to have that awareness. I think, sometimes, when I see people who are about to get into it with each other, I look at their bodies. You know, people just are tensing, or you hear it in their voice. Having those kinds of cues can help, wouldn’t you agree? Howard Ross: Absolutely, Pam. I mean, I’ve been a meditator for 20 years, and I teach mindfulness programs as well, and practicing mindfulness techniques is absolutely one of the tools we talk about in the book. There are breathing techniques or mindful meditation … Mindfulness practices can help that charged amygdala that I talked about earlier, that fear sensation, and calm it enough so that our prefrontal cortex, our more thoughtful, slow brain can come in and help us make reasoned decisions. Slowing ourselves down is so important that we not react impulsively. Pam Harper: Okay. So, beyond being aware of ourselves and our own biases, how can leaders become more aware of how structures, systems, and practices may be inadvertently exclusive? I mean, we make so many assumptions about what’s important. It’s as natural as breathing sometimes to put these things in place. But then somebody comes in and says, “Wait a second. Forget all that. You see that marker buoy out there two miles in the distance? Everybody go towards that direction.” In the process of moving towards that direction, these two flotillas of battleships come together because they’re all moving towards the same point. I think the vision and purpose of an organization could be helpful in that regard. If we set a clear sense of direction for what we’re trying to accomplish in the organization, what our values are, what our mission is as an organization, that becomes the standard. Not what your way or my way is but what our organizational commitment is, that can also bring people together. Pam Harper: Something that’s bigger than just you or me. It’s about us, and it’s a new us. And lo and behold, that task brought them together in ways that began to heal some of the divides. And so, working together in organizations, we could do that as well. Scott Harper: We’ve all heard the old saw about how common enemy will bring us together. That’s a negative thing, but a common purpose, something that we all value, is even better at doing that. Pam Harper: It’s that north star. So, the time’s gone by and here we are at the end of the episode. Do you have some final thoughts you can leave us with regarding how business leaders can bridge the growing divide between us and them? Howard Ross: Well of course. Very quickly, I would say this. As business leaders, we have a responsibility to our businesses, first of all, of course. Woodrow Wilson famously said, “The business of business is business,” and as somebody who’s the founder of a company and the owner of a company, I can appreciate that completely. But it’s important for us to recognize that this is a circumstance where businesses will do well by doing good. In other words, to the degree that we can help people deal with these issues and bring them together, the business will thrive. It will become a place that’s not only more effective, but it’s also an attractor of people who want to work in healthy workplaces. And so, I think that one of the most important things that we can do is for leaders to recognize that. Secondly, for leaders to take a stand by understanding their own biases, and by not allowing their own biases to choose favorites but to be more thoughtful about the decisions they make in organizations. And thirdly, to communicate regularly almost on a daily basis about the importance of the things that the business is there to accomplish. Pam Harper: Well thanks again for joining us today. Howard Ross: Oh, it’s my pleasure. I’ve enjoyed it thoroughly. Scott Harper: Thanks, Howard, and thanks to you out there for listening to Growth Igniters Radio with Pam Harper and Scott Harper. To check out resources related to today’s conversation, share on social media, read Howard’s bio, or open a conversation with us, go to GrowthIgnitersRadio.com and select episode 144. Scott Harper: What is the first thing we can do, starting today, to find and bridge us-and-them gaps in our own organization? Chris Curran: Growth Igniters and Growth Igniters radio with Pam Harper and Scott Harper are registered service marks of Business Advancement Incorporated. All Growth Igniters radio episodes are copyrighted productions of Business Advancement Incorporated, intended for the private use of our audience. Except as otherwise provided by copyright law, all other uses, including copying, editing, redistribution, and publication without prior written consent of Business Advancement Incorporated are prohibited. All rights reserved.